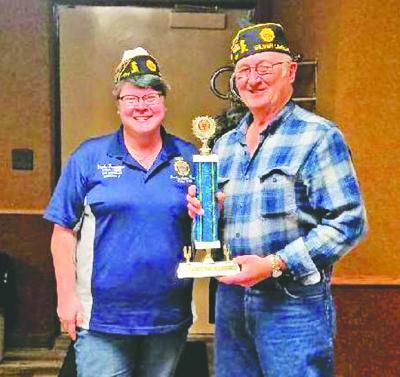 Silver Lake’s American Legion Post sergeant-at-arms Leon Pesina (right) accepted a second place trophy for the American Legion honor and color guard competition last summer in Rochester. The trophy was presented by Third District Commander Carla Tappainner. Leon Pesina and the members of the Silver Lake American Legion’s honor guard didn’t really seek state honors for their work representing their post and its members. But it’s an honor they’ll accept just the same. Pesina, the American Legion Post’s sergeant-at-arms, recently accepted, on behalf of the post’s color guard and funeral squad, second-place honors in a state competition held last summer at the Department of Minnesota Convention in Rochester. Minnesota American Legion Third District Commander Carla Tappainner made the trip from her home in Apple Valley to present the award to Pesina and the Silver Lake group at its Jan. 21 meeting. A former post commander, Pesina has served as Post 141’s sergeant-at-arms for over 15 years. He’s known throughout the area as one of the top leaders of a color guard and funeral squad. The group earned the honor at a convention in Rochester last July.